Leadpoint specializes in high-performance work teams for the waste and recycling industry, with a staff that brings extensive experience and first-hand expertise to every MRF we serve. We believe that when you shift your focus from headcount to individual performance, you can improve the effectiveness of your entire operation. That’s what Leadpoint does. We pioneered the high-performance work team model for blue-collar production environments. Since 2000, Leadpoint has provided workforce solutions to some of the toughest hiring challenges out there, backed by a data-driven approach for optimizing performance to MRFs nationwide. 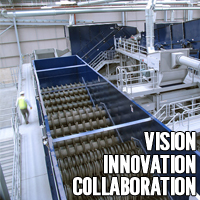 VAN DYK Recycling Solutions is North America’s leading designer and system supplier of world-class recycling and recovery technology, and the exclusive distributor of Bollegraaf, Lubo, and TOMRA machinery. We specialize in proven technology in the fields of sizing, sorting, recovery, and baling of recyclables. Our systems provide solutions for single stream, commercial waste, C&D, MSW, waste-to-energy/fuel, presorted plastics, and e-waste markets. Technologies in our arsenal include high-capacity pre-press flap balers, sensor based sorters, PaperMagnets®, StarScreens®, anti-wrapping screens, density separators, air systems, and trommel screens. Our turnkey service fully equips with design, installation, training, and superior, lifelong support. Accent Wire is the leading provider of baling wire and wire tier solutions in North America. all makes of wire tiers. Founded in 1976 and headquartered in Eugene, Oregon, BHS designs, manufactures and installs processing systems tailored to sort material and extract recyclables from waste streams. Quality. Reliability. Excellence in Design. Bulk Handling Systems (BHS) designs, engineers, manufactures, and installs unparalleled sorting and handling systems throughout the world for the recycling, solid waste, wood products, and power generation industries. BHS custom-designed systems at material recovery facilities (MRFs) efficiently extract recyclables from a variety of waste streams at recovery rates in excess of 99%, greatly minimizing the residue that hits landfills. BHS leads the industry in technology innovation, holding numerous patents for equipment and system designs. BHS’ commitment to innovative design and engineering, quality manufacturing, exceptional customer service, timely delivery and long-lasting, efficient systems contribute to the company’s strong reputation and success. Fire Rover portable fire detection and suppression systems prevent fire 24/7,365. Fire Rover is equipped with the FLIR A310F thermal camera, live-video surveillance system and a powerful foam dispensing unit containing industries only dual UL listed fire suppressing agent. Fire Rover is the only solution proven to end the threat of fires at recycling facilities. International Baler has been a leader in design and manufacture of commercial and industrial recycling equipment since 1946. We also offer expertise in systems engineering, customer support services and application consultation. As a single source manufacturer, IBC is committed to providing leading edge technology, unsurpassed quality, and commitment to competitive prices, service and parts. We offer over 200 different standard models of Vertical Balers, Closed-Door Horizontals, Open-End Auto-ties, and Two-ram Balers. We also custom configure units to fit applications with special requirements, allowing us to stay at the forefront of baler technology and on top of new and emerging markets. Javelin Manufacturing is a consortium of firms that brings decades of manufacturing, service and installation, sales and engineering services to the scrap and recycling industry.